hands. Knead the meat in the bowl if you must. Gradually blend in the soy sauce,black pepper, egg, and salt until all ingredients are evenly distributed. 2. Lay out a few wrappers at a time on a flat surface, and cut it into half (cut into triangle shape )and place about 1 tablespoons of the filling in a line down the center of the wrapper. Make sure the filling is no thicker than yourthumb, or the wrapper will cook faster than the meat. Take the bottom and top edges of the wrapper and fold them towards the center. Take the left and right sides, and fold them towards the center. Moisten the last edge of the wrapper with egg white or water to seal. Now repeat using the rest of the wrappers, and have hubby or the kids help you out. 3. Heat the oil in a deep-fryer or heavy skillet to 375 degrees F (190 degrees C). Fry 3 or 4 lumpia at a time. Fry for about 3 or 4 minutes, turning once. Lumpia are cooked through when they float, and the wrapper is golden brown. Cut in half, or serve as is with dipping sauce. We like sweet and sour sauce, soy sauce with lemon, or banana ketchup. 4. If you don’t have deep fryer you can just fry it in a regular pan. Or small deep pot. Heat oil in a wok or large skillet over medium heat. Sauté chorizo, onion and garlic until soft. Stir in chicken cabbage, carrots, celery and soy sauce. 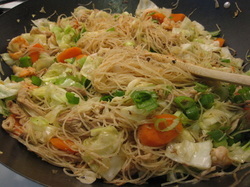 Cook until the vegetable are slightly crunchy (half cook). Then when done set aside the veggies and meat. Use the same pan. Put the Chicken broth boil then toss in noodles, and cook until heated through, stirring constantly. "Beef & Veggies Over Rice"
1. Put oil in wok or big pan at med-high heat. Add garlic, ginger, and ground red pepper. Cook several minutes, then add ground beef, soy sauce, a little salt, pepper, and sugar. 2. When meat is done, add eggplant and ketchup. If mixture looks dry, add a small amount of water. Cover to help steam eggplant. Cook until done. 3. Add cilantro, and serve over rice. 1. Bake chicken on a sheet pan at 375 for 20-30 minutes until chicken at the thickest part is white (cut to test). 2. Sprinkle with barbecue sauce to taste (1-2 teaspoons per breast). 3. Top with a couple of tablespoons of shredded cheese and some bacon or turkey bacon. 4. Place back in the oven on broil until the cheese melts. 5. Top with tomatoes and green onions and serve! Any of these veggies can be switched out or substituted--it's what you have on hand. You could add asparagus, broccoli, cauliflower, onions, etc. The only rule of thumb is: the harder the vegetable, cut it a little smaller (carrots, parsnips, white potatoes, etc); the softer or mushier the vegetable, leave it whole or chunky (sweet potato, pears, mushrooms). White wine I think pairs best with the lemon, but red works, too--it's what we had at the demo. And, it's so good with those mushrooms! 1. Place vegetables in a Pyrex or baking pan. 2. Toss with olive oil. 3. Sprinkle garlic, thyme, rosemary, salt, and pepper on to taste. 4. Place lemons and parsley around. 5. Cover with aluminum foil and bake at 375 for no less than an hour and forty-five minutes. I usually just fix it, bake it for two hours, and everything comes out tender. PS. Toss the lemons away if you save any leftovers--they seem to have an extra powerful wang after a day or two in the fridge. 1. Place cleaned peppers on a pan/cookie sheet with aluminum foil. 2. Sprinkle with olive oil—about a teaspoon per half. 3. Cook in oven at 400 until the pepper is charred slightly black (15-25 minutes). 4. Blend in a food processor or blender. Add salt to taste and about a tablespoon of olive oil. 5. Serve with your favorite veggies or crackers. brown sugar and stir til dissolved. Simmer on low heat while cooking meat. not crisp the cornstarch). Cook meat for about 2 min until the cornstarch becomes a crispy layer. add it to heat later and the meat is really thin so it will cook fast. 1. Drain canned beans, reserving half a cup of liquid, or use dried beans. You can soak the beans overnight (8 hrs) or use the quick soak method (boil 2 minutes and let rest an hour). Canned beans work well, but the dried beans tend to have the best flavor, I’ve found. But, I’m not above using them for the convenience!!! 2. Put beans in the food processor or blender. Add two cloves of garlic, peeled, which you can chop in half so they are about the same size as the chick peas, or just plop them in. 3. Add the salt, olive oil, tahini. You can salt to taste later, too. 4. Squeeze the lemon juice into the mix. 5. Pulse the food processor or blender a five to six times and then scrape the sides to get any big chunks. The mixture will look almost like a ball of dough. 6. Blend again, adding your liquid slowly as the mixture blends until the mixture looks creamy. Scrape the sides as needed. You may need more liquid if you used dried beans. 7. Test to see if your hummus is salted and garlicky to your taste. (May still taste a little gritty at this point). 8. 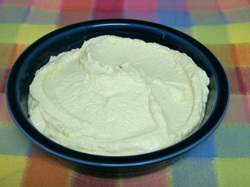 Blend for roughly ten minutes to give the hummus a light, creamy texture. Variations: More garlic or a dash of crushed red pepper adds heat. You can add roasted red pepper or olives for a tangy flavor. Dip with veggies, pita, pretzels, or use it instead of mayonnaise on sandwiches. For parties, garnish with olive oil and kalamata olives. If you use dried beans, I’ve found you can freeze the remainder and make another batch or cook with them later. *I tinkered with the Kroger brand hummus recipe on the back of the chick pea can to get the flavors I wanted--you can, too!!! We have used whole wheat flour from the Indian store as its a little different from the whole wheat flour that you find in the grocery stores. The one in the American grocery stores is usually a lot darker in color, so chapattis turn a little browner than you probably like them, this one is available in any Indian store its called chapatti atta and is readily available. Just mix all that dough in and form a nice ball. It doesn't take a lot of time at all. When the dough is in a nice ball, we're going to take just a couple of drops of oil, just to lightly coat it and in that way it doesn't form a dry skin on top of the dough. Then keep it covered for about 15 to 20 minutes. After it has been resting for about 15 to 20 minutes we're going to knead the dough one more time quickly. This is 1 and 1/2 cups of dry flour, so it makes approximately 9 chapattis. But there's no signs involved, so if you like really big chapattis it can be less and if you want small ones you know it'll make more. But something that fits in to your palm or close fist, a kind of a golf size ball is perfect.So just divide it out. Before we start rolling out our chapattis we'll go ahead and turn on our stove and get our pan heated. The pan we are using is called a tawa. You can also use a non stick frying pan. Put the stove on medium heat, or a little bit higher than medium. And you want to make sure your pan is really hot before you put your first chapatti on. So while our pan is heating, we're going to take our dough and form a nice round ball. If you start off with a round ball, the shape changes, but your final chapatti will probably be round also. We're then going to dip it in some dry flour, shake off the excess and role it out. if you notice that your chapatti is sticking to the ground or to whatever surface you are rolling out on, take it and dip it again in the dry flour. This is a trick that my mom taught me when i was learning how to do this when i was little, you rub your hand across it, and instantly you'll feel where its thicker and where it's thinner and then you can just roll the parts that are thicker, that way you don't have a chapatti that is really thin on one side and really thick on the other side that also helps in blowing up when you're cooking it. The tawa looks hot so we're going to put our rolled chapatti in and move it around to make sure it doesn't stick. Then we leave it alone until we start seeing bubbles appearing, and then we're going to flip it around, and let go for a few seconds. Now we're going to take some oil and you can just dip your spoon in to your oil and then whatever is left, the remainder few drops, just put it on and smear it on like that and flip it around and press. You want to press where it bubbles to force the air to the other side which is not risen yet. Smear the oil again and press. You want to cook the chapatti until you see that all the doughiness is gone and it looks fully cooked. It's ok to have little brown spots on it.